For those who don’t know the online magazine Good, you should. Beyond it’s amazing infographics, they publish some of the best articles to be seen online and somehow, are almost always able to be consistently well, good. 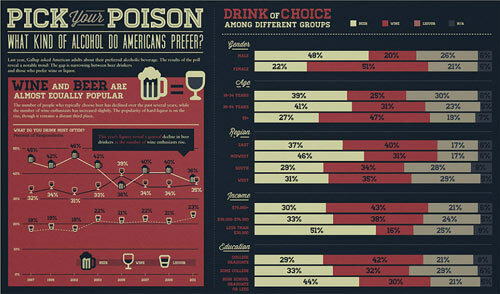 One of their latest items shows American drinking trends over the last 14 years. If one were to look at the information on the right, it would be easy to say that wine drinkers are primarily rich, older, educated women from the East Coast and beer drinkers were primarily younger guys from the Midwest with less income and education. The immediate data is only part of the story though as it shows that imbibing trends are overall drifting away from beer. As they show, beer and wine drinking are basically even now in the United States with liquor taking up a distance, yet substantial third place. All of this is to say that wine is getting more mainstream in what has been a Nation of Beer for some time. Unfortunately this probably won’t bring down prices as there will be more demand for what is currently tough domestic harvest times.